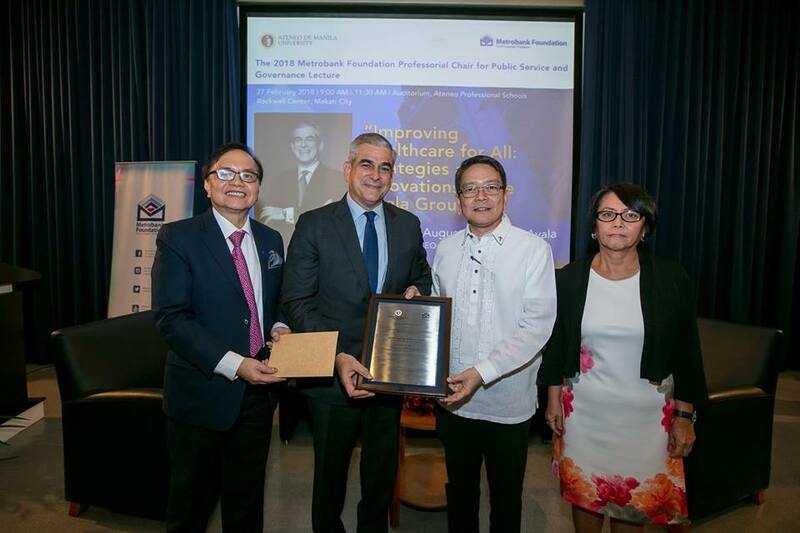 Ayala Corp. chair and CEO Jaime Augusto Zobel de Ayala is this year’s holder of the Metrobank Foundation Professorial Chair for Public Service and Governance as a corporate champion of innovative healthcare solutions. Zobel was the first from the private sector to receive this distinction by the Ateneo Professional Schools and Metrobank Foundation. Delivering a lecture titled “Improving Healthcare for All: Strategies & Innovations at the Ayala Group” at the Ateneo Professional Schools auditorium in Makati City, Zobel said the private sector, with its access to capital-intensive markets, plays a crucial role in filling healthcare gaps through pursuing cutting edge approaches that address urgent social needs. Taking cue from his own backyard, Zobel said the Ayala Group embraces reinvention and diversification with the roll out of pharmaceuticals and small community-based clinics that reach a wider segment of the population. In recent years, the country’s oldest conglomerate has expanded their healthcare ventures under the brand names Generika pharmacies, MedGrocer online pharmacies, and FamilyDOC primary care clinics. “To us, the most powerful type of innovation is building businesses that address social needs and improve lives,” Zobel said. Zobel also called for a collaborative approach between the public and private sector towards the common goal of improving healthcare for all. MBFI president Aniceto Sobrepeña, who also serves as the acting president of Manila Doctors Hospital, reaffirmed Zobel’s call for a more intensive public-private collaboration in healthcare, noting that both parties have the same goal – to make the Philippines a better and healthier place. “To improve the Philippine health situation, institutions, both public and private, can no longer work in silos. We must work hand in hand. This is why we are happy to name Mr. Zobel as this year’s Metrobank Foundation Professorial Chairholder,” Sobrepeña said. The Metrobank Foundation Professional Chair for Public Service and Governance, a joint undertaking between the Metrobank Foundation and the Ateneo de Manila University started in 2010, seeks to give due recognition to distinguished servant leaders for their exceptional contributions and achievements in the public and private sectors. The undertaking is rooted in the common vision of encouraging Filipinos to contribute to national development by providing a platform for sharing cutting edge research and innovations. Other notable professorial chairholders include Vice President Maria Leonor Robredo (2017), Ombudsman Conchita Carpio-Morales (2016), former Department of Social Welfare and Development Secretary Corazon Soliman (2015), former Department of Foreign Affairs Secretary Albert del Rosario (2014), former Department of Budget Management Secretary Florencio Abad (2013), and former Presidential Adviser on the Peace Process Teresita Quintos- Deles (2012).